This post is about a recipe that has been a bit of a game changer for me. I feel like invented it, although I’m (quite) sure I wasn’t the first. It came to me when I was thinking about where I used the most refined fats in my cooking. When they are extra virgin and super fresh, oils can be healthy, but more often than not, they sit on your counter instead of your fridge, and can be rancid before they even get to your grocery cart. 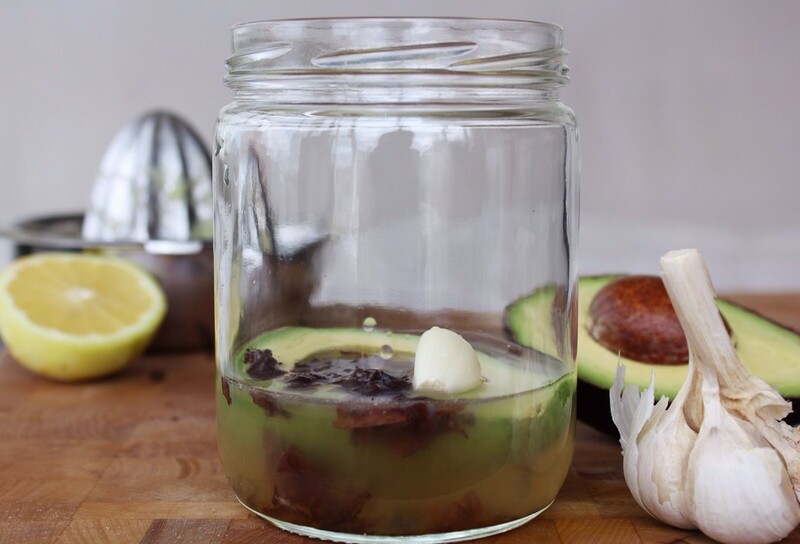 Although I do use some oils (mostly extra virgin coconut or olive oil), I try to use whole-food fats in their place whenever I can (avocados, coconut, nuts, seeds). It’s not always possible, but often it is (especially if you are not deep frying), it just takes a little more creativity. The first time I tried making salad dressing with avocado in place of any oil, almost everybody within texting (also whatsapp) distance got to hear about it. To be fair, it was that exciting. It opened up a whole new world of even healthier fat, enzyme-rich, oil-free, salad experimenting. Avocado is very high in fat, but it is a healthy and whole-food fat. Also, the fat hasn’t been extracted from the fruit, so you are getting the whole package, including fiber (who’d have thought? ), glutathione (an antioxidant beast), Lutein (lowers breast cancer risk, I’ll take it), and oleic acid, (a healthy monounsaturated fat, thought to reduce inflammation and decrease breast cancer risk, also awesome). This is just the tip of the ice burg, avocados are amazing. Despite its decisive texture, the avocado doesn’t take a strong stance on flavour, so it tends to take on the flavours that it is paired with quite well. Avocado-based chocolate mousse? Sure. 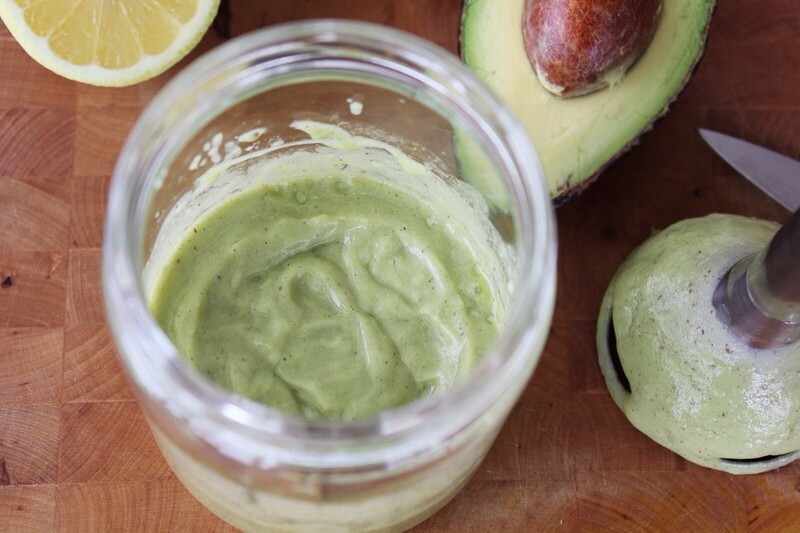 Avocado-based pesto? Why not. See what I mean? So really, a perfectly delicious avocado-based Caesar salad dressing was not a stretch, and somewhat inevitable. 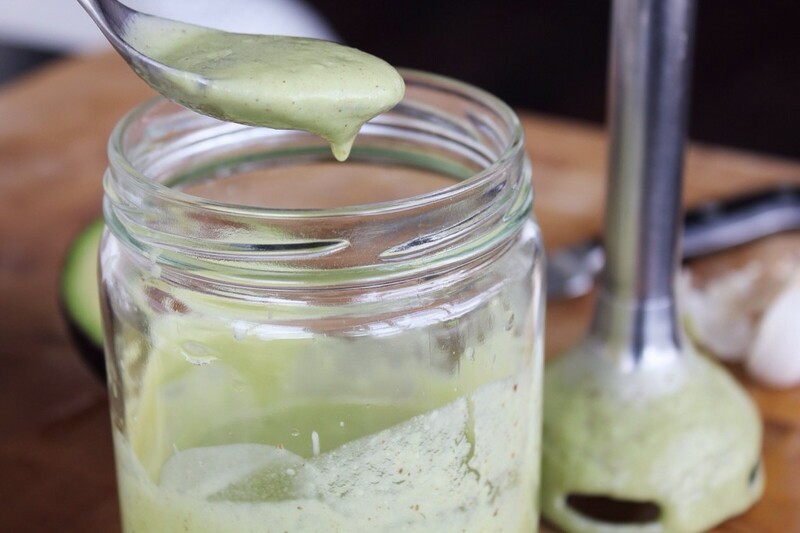 This is a raw salad dressing, and the base is blended avocado, so it doesn’t last as long as your classic oil-based salad dressing does. Maybe 3 days tops. It also makes a great veggie dip or spread, so if you have a little extra, it is very easy to use up, and you will be happy to have it around. 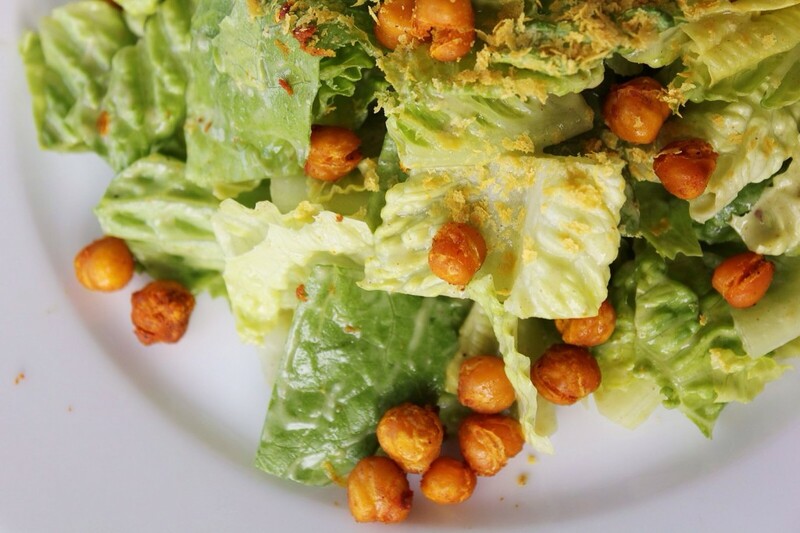 It makes a clean tasting Caesar salad, not the gut bomb we have become more accustomed to. It also offers the fat necessary to absorb the nutrients in the greens, and the right amount of viscosity to coat the greens properly. I used romaine as the classic Caesar salad lettuce of choice for this post, but have also made it with curly kale (I definitely didn’t invent this concept, the kale Caesar salad is a brilliant addition to menus everywhere at the moment), Napa cabbage (the tall, pale one), and purple cabbage, with some grated root veg thrown in. For the dressing, add more or less garlic (keeping in mind that it is a powerful immune booster) and embrace the dulse in place of the squished anchovies-in-a-tube for some mild sea flavour and thyroid-supporting minerals. If I am making this for a client or a friend, I make the dressing at the very last minute, have the greens washed and dried and put into its own conatiner and the croutons made and cooled in their own container. It can all go into their fridge, and when they are ready to eat, they can toss together as much or little as they want (just make sure they know how long the dressing will last). In my house, we literally eat this salad once a week (usually with a baked sweet potato). It guarantees a sound sleep with happy dreams. This makes enough for 1 head of romaine lettuce. It will keep for up to 3 days. In a blender/hand blender, blend everything, EXCEPT the lemon zest together. 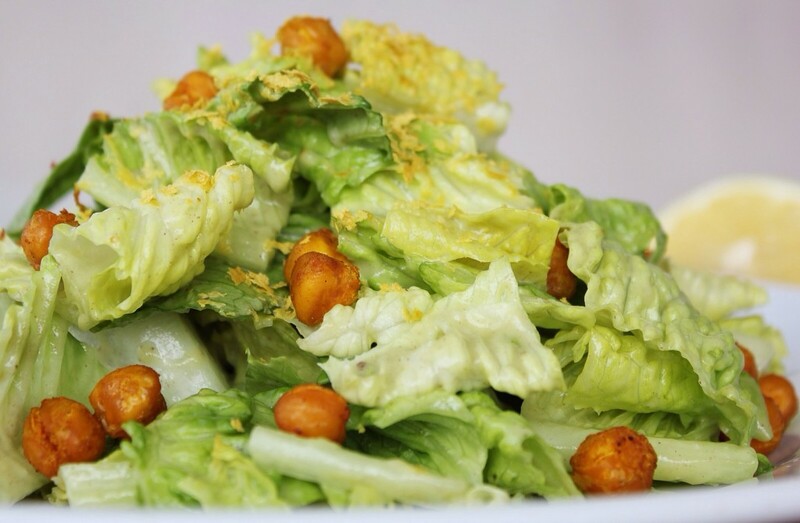 Toss with lemon zest and 1 head of romaine lettuce, kale, Napa cabbage or, really any other vegetable. 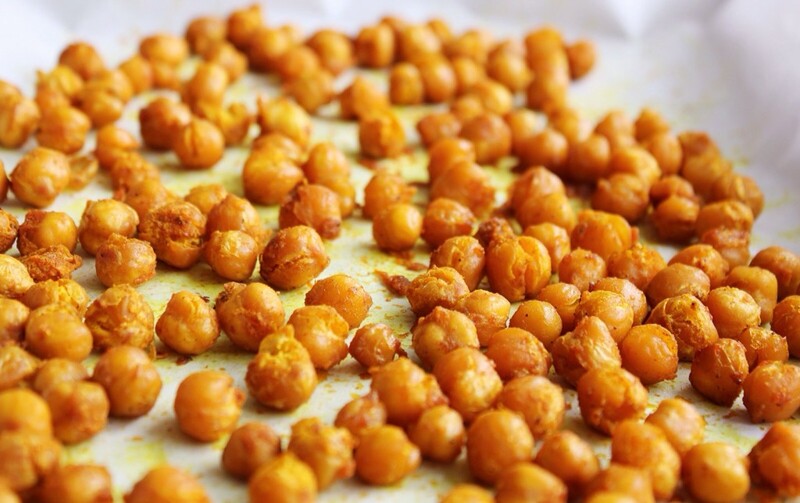 Optional: toss with chickpea croutons (recipe below) and add a sprinkling of nutritional yeast on top (reminiscent of Parmesan). 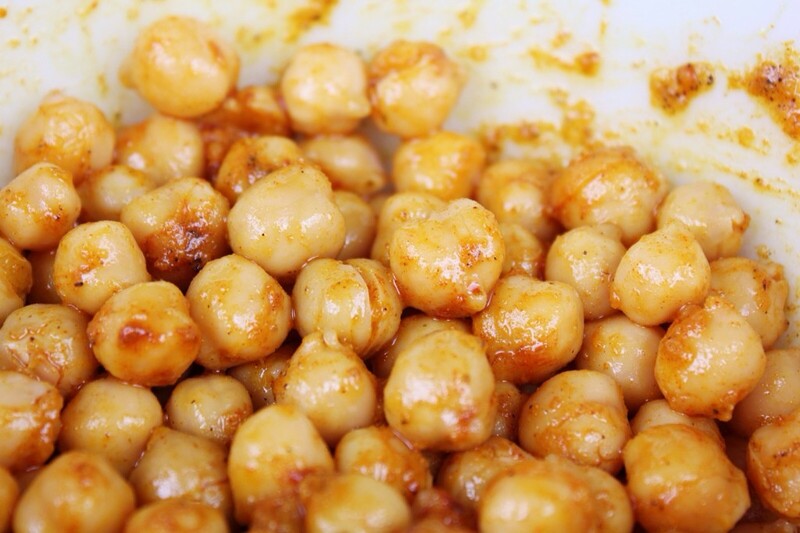 Toss the cooked chickpeas (either from the can, or preferably, soaked overnight and then simmered with a piece of Kombu until soft) together in a bowl with the rest of the ingredients. Spread out on a parchment-lined baking sheet and roast at 325*F for 30 minutes, or until they start to dry out and any liquid on the sheet has evaporated. Add to the salad either warm or cooled slightly.